Nineteenth-century medical practitioners objected that Continental vivisection displays were cruel, unnecessary, and gave their profession a bad name. After the first law to protect animals was passed, anti-cruelty campaigners formed organisations such as the RSPCA to prosecute acts of brutality, which they thought tended to promote a culture of violence, but they allowed medics to self-regulate as their moral integrity was assumed to be irreproachable. Once the Vivisection Act came into force, however, the public became concerned about the readiness with which licenses were issued. The history of vivisection is inseparable from that of medical science. Without animal experimentation, the course of medicine would have been radically different (one can admit as much without making any presumption about the validity of animal models). Since the nineteenth century, laboratory experimentation has become the gold standard of academic medicine, shaping not only its approach to solving problems, but also the moral conduct and education of doctors. To experimentalists, it was axiomatic that medical science must be objective, rational, and dispassionate: if its advancement required the infliction of pain on laboratory animals, then it was unprofessional, even unethical, to allow squeamishness or sentiment to get in the way. Thus there arose a tension in medicine between the scientific spirit of cool indifference to suffering and the clinical tradition of compassion and caring. When the Continental fashion for vivisection first touched Britain in the 1820s, many doctors chose to distance themselves from it for the sake of their reputation, and the few who did undertake it felt the need to defend a choice that seemed at odds with the ethos of their profession. Though ‘anti-vivisection’ became, in the course of the nineteenth century, so familiar a term of self-description that it would be obtuse to call organized opposition to animal experimentation by any other name, its use has perhaps distorted the way that both the individuals and organizations involved have been understood, implying as it does protest, negativity and perhaps even rejection of progress—a campaign by some out of step luddites and radicals to halt the march of science, or to make a heavy-handed moral point about the abuse of power within society. It would, however, be no less apt to view vivisectionists as the protesters and their opponents as the conservative majority. There was never a time in Britain when there were more people active in support of vivisection than against it, and in the nineteenth century the antis raised petitions with hundreds of thousands of signatures, more than for any other cause of the time. A key question for the historian is why, considering the level of popular support and money at their disposal, anti-vivisectionists made so little progress in curbing, still less ending, experiments on animals. The remarkable success of experimentalists in winning over the government, legislature, and universities, and in carrying through their objectives in a nation of reputed animal lovers, which proved critical in shaping the course of medical science and ethics, also calls for an explanation. During the nineteenth century, the anti-cruelty lobby went from being largely unaware of vivisection to passionately opposing it, largely due to a few high-profile incidents. By the century’s end, anti-vivisection had become a humanitarian cause celebre, a mainstream issue with great public support and many societies dedicated to it, despite vivisection being responsible for only a tiny fraction of the vast amount of suffering inflicted on animals by human hands. Vivisection was seen as different from other forms of cruelty, such as the mistreatment of farm and draught animals, partly because those responsible were linked with the healing and academic professions, whose morality was supposed to be beyond reproach, and also because it had implications beyond animal welfare: for the way society made ethical choices, for how science should be conducted, and for how humans saw themselves in relation to the rest of creation. Because of the multiplicity of moral problems that vivisection raised, the anti-vivisection movement attracted people with all sorts of religious, political, and social principles to defend, and with such disparate views that, according to Vyvyan, anti-vivisection was often the only thing they had in common. The resurgence of interest in animal protection in the 1970s prompted historians to revisit its history, and pioneering studies such as those of Richard French set early-nineteenth century anxieties over cruelty to animals in the context of post-Revolutionary concerns about the damage that a culture of violence might do to human society. 1 According to French and to Anita Guerrini, calls for laws to protect animals were primarily a form of social self-defence, requiring the government, with the cooperation of middle class activists, to legislate to control the violent impulses of an underclass who lacked the wherewithal to regulate themselves, and who, if permitted to acquire a taste for blood, might soon become ungovernable. At the other end of the spectrum of anthropocentric concern for mistreated animals there were radicals, particularly feminists and socialists, who saw animals as surrogates for disempowered humans. 2 If one adds to these British doctors who resented the introduction of novel, Continental experimental methods that challenged their tradition of observational bedside medicine, it can be seen that there were plenty of people calling for a ban on vivisection who were concerned with their own interests rather than those of animals. Martin’s Act did not mention vivisection, probably because he was unaware of it. It was a sign of their rarity in Britain that even someone as concerned as he about animal welfare does not seem to have known about experiments on animals until 1824, when the French physiologist François Magendie (1783–1855) gave a widely-reported demonstration at London’s Windmill Street anatomy school. 11 The published accounts of Magendie’s experiment, in which he nailed a greyhound to the dissecting-table before cutting it open, provoked a vociferous anti-French outcry that marked the start of the organized anti-vivisection movement in Britain. 12 Thereafter, Martin spoke out against Magendie in particular and vivisection in general, but his own law was powerless to stop it because scientific experiments were performed in a deliberate, calculated manner and not ‘wantonly’, and so could not, by definition, be cruel under the law. 13 The need to show they were compliant with anti-cruelty law inclined future experimenters to favour utilitarian arguments, because anticipated benefits to human health provided a clear, rational justification for their work. There is no official record of how many experiments on animals were performed in Britain before the 1876 Vivisection Act , but few were reported in medical journals (most of the experiments published in British journals were performed in France or Germany) and they do seem to have been truly rare. Concerns within the medical profession were probably instrumental in keeping them so, though the few British doctors who did vivisect met with less criticism in the press than their Continental counterparts, partly because there was an element of nationalism behind protests against French physiologists, but also because the English tended not to carry on their work in public. A degree of fortitude and resolve was expected of all well-bred men, and anti-vivisectionists and others who were thought to be deficient in these manly, Christian virtues were criticised as ‘effeminate’. As some seventy percent of anti-vivisectionists were women, some of whom used the abuse of animals as a metaphor for their own perceived vulnerability, the cause itself came to be seen as feminine, and men who took it up were subject to accusations of unmanliness. 44 One critic called anti-vivisectionists ‘old ladies of both sexes’, the implication being that their opinions were formed by emotion rather than intellect and were therefore out of place in a scientific debate. 45 Experimenters faced the opposite criticism, that they were so dispassionate as to be wanting in normal human feeling. That medical practitioners who made public statements about vivisection predominantly opposed it, while those who supported it maintained a low profile, suggests that sensitivity was a quality more attractive to potential patients than fortitude and commitment to medical science. Another common methodological criticism was that animal physiology differed so greatly from the human that results could not be extrapolated. 56 In theory, this was difficult for experimenters to counter because if animals were physiologically similar to humans, they likely felt as humans did and so it was cruel to make them suffer, while if they lacked human sensitivity to pain, they were significantly different from us physiologically: so an experiment was ‘criminal’ if an animals’ physiology was like ours and ‘objectless’ if it was not. 57 Though this might seem a powerful argument against experimentation, it was unusual for nineteenth-century vivisectors to concern themselves with animal pain at all: like Darwin, they could accept that ‘[t]he lower animals, like man, manifestly feel pleasure and pain, happiness and misery’ and still consider vivisection justifiable. 58 We will consider in the following chapter whether the categorical difference between humans and animals that left the latter vulnerable to experiment was primarily spiritual rather than physiological. British vivisectionists were, however, prepared to accept that many Continental experiments were unnecessary, and they criticized the French, in particular, for an excess of speculative studies and public demonstrations. The relatively few British doctors who did vivisect—most notably Marshall Hall (1790–1857), James Blundell (1791–1878), James Hope (1801–1841) and Charles J.B. Williams (1805–1889)—were prudent and discrete, working privately, publishing in professional journals, and following prearranged lines of investigation. Overall, they were successful in avoiding public scrutiny. Hall, for example, repeated some of Magendie’s experiments in the 1820s, including one in which he opened the chest of a dog and then made him vomit, whereon, according to Hall’s own account, ‘a portion of lung was driven through the thoracic opening with violence and a sort of explosion’. 64 Though he was criticized in the medical press for this work, there was no public outcry, probably because lay people were simply unaware of it. 65 Shortly afterwards, Hall published his own ‘objective’ criteria for deciding whether experiments on animals were justified: the information sought must not be obtainable by observation alone, the experiment must have a distinct and definite object, it must not be a repeat, it must cause the least possible suffering to the least sentient animal, and must be properly witnessed and recorded. 66 Though they made little impact at the time, his rules would influence the drafting of the Antivivisection Act 40 years later. When you say that you use them [anaesthetics] for convenience sake, do you mean that you have no regard at all for the sufferings of the animals? You are prepared to establish that as a principle of which you approve? Wary of being thought at best heartless and at worst dangerous, experimental physiologists liked to emphasise that their chosen work was disagreeable to them. According to one sympathetic account, the real sacrifices were being made not by the animals but the experimenters: ‘we have heard a considerable number of physiologists declare unanimously, that all vivisection tires them exceedingly; sometimes so shatters them, that it requires all their power of will to carry the process through to the accomplishment of the aim…’. 88 This at least indicates they were aware of the importance of character and sensibility in determining how others judged their actions. From a utilitarian perspective, the case for vivisection would have been stronger if, in addition to acquiring knowledge from it, physiologists enjoyed their work rather than enduring it; by stating that they undertook experiments reluctantly and at great emotional cost to themselves, they were defending their personal virtue by taking on the persona of the heroic scientist who suffers emotional difficulty through being obliged to transgress normal moral boundaries for the sake of science. How people answered such questions would determine whether they gave their money, and trusted their health, to vivisectionists, and whether they saw the rise of laboratory medicine as a major advance or a wrong turning. French, Antivivisection and Medical Science (French 1975). Anita Guerrini, ‘Animal experiments and anti-vivisection debates in the 1820s’, in C. Knellwolf and J. Goodall (eds. ), Frankenstein’s Science: Experimentation and Discovery in Romantic Culture, 1780–1830 (Aldershot: Ashgate, 2008), 71–86; Coral Lansbury, The Old Brown Dog: Women, Workers, and Vivisection in Edwardian England (Madison, WI: University of Wisconsin Press, 1985); Mary Ann Elston, ‘Women and anti-vivisection in Victorian England, 1870–1900’, in Rupke, Vivisection in Historical Perspective; Hilda Kean, ‘The “smooth, cool men of science:” the feminist and socialist response to vivisection’, History Workshop Journal, 40 (1995), 16–38; Hilda Kean, Animal Rights: Social and Political Change since 1800 (London: Reaction, 1998); Ian Miller, ‘Necessary torture? 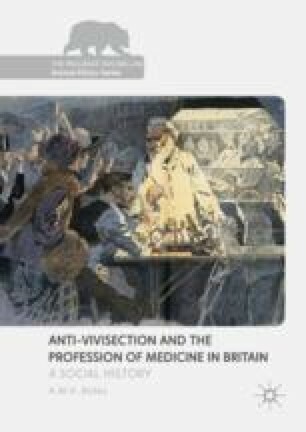 Vivisection, suffragette force-feeding, and responses to scientific medicine in Britain c. 1870–1920’, Journal of the History of Medicine and Allied Sciences, 64 (2009), 333–372 (Guerrini 2008; Lansbury 1985; Elston 1987; Kean 1995, 1998; Miller 2009). Andrew Linzey (ed. ), The Link between Animal Abuse and Human Violence (Brighton: Sussex Academic Press, Linzey 2009) (Linzey 2009). Charles D. Niven, History of the Humane Movement (London: Johnson Publications, 1967), 57–58; Kean, Animal Rights, 33–34 (Niven 1967). Niven, History of the Humane Movement, 61 (1967). Gordon Hughes and Claire Lawson, ‘RSPCA and the criminology of social control’, Crime, Law and Social Change, 55 (2011), 375–389 (Hughes and Lawson 2011). SPCA, Sixth Report and Proceedings (London: W. Molineux, 1832) (SPCA 1832). Kean, Animal Rights, 36 (1998). Anon., Animals Friend, 7 (1839), 51. ‘Society for the prevention of cruelty to animals’, Evangelical Magazine and Missionary Chronicle, 2 (1824), 357–358. ‘On experiments on living animals’, London Medical Gazette, 20 (1837), 804–808. J.M.D. Olmsted, François Magendie: Pioneer in Experimental Physiology and Scientific Medicine in Nineteenth-Century France (New York, NY: Schuman, 1944), 137 (Olmsted 1944). ‘Vivisection per se cannot be ranked among acts of cruelty’: see, ‘The ethics of vivisection’, Lancet, 2 (1860), 143–144. George F. Etherington, Vivisection Investigated and Vindicated (Edinburgh: P. Richard, 1842), 17 (Etherington 1842). François Magendie (transl. E. Milligan), An Elementary Compendium of Physiology; for the use of Students (Philadelphia: James Webster, 1824), 261; Etherington, Vivisection Investigated, 80 (Magendie 1824). ‘Physiology’, Medico-Chirurgical Review, 3 (1825), 198–200; Etherington, Vivisection Investigated, 111. Olmsted, François Magendie (1994), 221–222 (Olmsted 1944). ‘Bills to prevent cruelty to animals’, Parliamentary History and Review (1826), 756–775. David Mushet, The Wrongs of the Animal World (London: Hatchard and Son, 1839), 209 (Mushet 1839). ‘Society for preventing cruelty to animals’, Morning Chronicle, June 1825, 3 (Society for preventing cruelty to animals 1825). Lewis Gompertz, Moral Inquiries on the Situation of Man and Brutes; On the Crime of Committing Cruelty on Brutes, and of Sacrificing Them to the Purposes of Man (Fontwell: Centaur Press, 1992), 147 (Gompertz 1992). J. Chippendale, ‘Experiments on animals’, Lancet, 1 (1839), 357–358 (Chippendale 1839). ‘Amendment of the laws to prevent cruelty to animals’, Animals Friend, 2 (1834), 11–15. The bill (5 and 6 William IV. c. 59) was passed with the help of Quaker MP Joseph Pease. ‘Physiology’, Medico-Chirurgical Review, 3 (1825), 198–200. ‘Correspondence on field sports and surgical experiments on living animals’, Animals Friend, 6 (1838), 21. Trevor Stammers, ‘The NHS—no place for conscience’, Catholic Medical Quarterly, 63 (2013), 12–14 (Stammers 2013). Lloyd G. Stevenson, ‘Religious elements in the background of the British anti-vivisection movement’, Yale Journal of Biology and Medicine, 29 (1956), 125–157. No such restriction on jurors ever existed: Leigh Hunt, Essays (London: Edward Moxon, 1841), 47–48 (Stevenson 1956; Hunt 1841). James Lawson Drummond, ‘On humanity’, London Medical Gazette, 24 (1838/1839), 160–163 (Drummond 1838/1839). A.W. Bates, ‘“Indecent and demoralising representations”: public anatomy museums in mid-Victorian England’, Medical History, 52 (2008), 1–22 (Bates 2008). Anon. ‘Five reasons against cruelty to animals’, Animals Friend, 1 (1833), 14 (Anon 1833). Rob Boddice, A History of Attitudes and Behaviours toward Animals in Eighteenth- and Nineteenth-Century Britain: Anthropocentrism and the Emergence of Animals (Lampeter: Mellen, 2007); Anita Guerrini, ‘Animal experiments’ (Boddice 2007). ‘Surgical experiments on living animals’, Animals Friend, 7 (1839), 61–62. Anon., The Young Gentleman’s Book (London: Baldwin and Cradock, 1832), 249. A.W. Bates, ‘Vivisection, virtue ethics, and the law in 19th-century Britain’, Journal of Animal Ethics, 4 (2014), 30–44 (Bates 2014). Thomas Percival, Medical Ethics, or a Code of Institutions and Precepts Adapted to the Professional Conduct of Physicians and Surgeons (Manchester: S. Russell, 1803) (Percival 1803). William Benjamin Carpenter, ‘The ethics of vivisection’, Fortnightly Review, 31 (1882), 237–246 (Carpenter 1882). Olmsted, François Magendie (1944), 221–222 (Olmsted 1944). Samuel Johnson, Idler, 17 (1758), 64. Anon., ‘Vivisections in France’, BMJ, 2 (1863), 215. ‘Dr Knox, of Edinburgh’, Medical Times, 10 (1844), 245–246; William Hamilton Drummond, The Rights of Animals, and Man’s Obligation to treat them with Humanity (London: John Mardon, 1838), 23, 148. (Knox 1844; Drummond 1838). Charles Darwin, The Descent of Man (London: John Murray, 1871), 2 vols, 1, 101 (Darwin 1871). ‘Body-snatchers’, Church and State Review, July 1862, 87; James A. Steintrager, Cruel Delight: Enlightenment Culture and the Inhuman (Bloomington, IN: Indiana University Press, 2004), 64, 124 (Steintrager 2004). Andreas-Holger Maehle, ‘The ethics of experimenting on animal subjects’, in Robert B. Baker and Laurence B. McCullough (eds), The Cambridge World History of Medical Ethics (Cambridge, Cambridge University Press, 2014), 552–557 (Maehle 2014). Andrew Wynter, Subtle Brains and Lissom Fingers: Being Some of the Chisel-Marks of Our Industrial and Scientific Progress, and Other Papers (London: Robert Hardwicke, 1863), 66 (Wynter 1863). George Bernard Shaw, Prefaces (London: Constable, 1934), 257 (Shaw 1934). Hayley Rose Glaholt, ‘Vivisection as war: the “moral diseases” of animal experimentation and slavery in British Victorian Quaker pacifist ethics’, Society and Animals, 20 (2012), 154–172 (Glaholt 2012). ‘The British Association for the Advancement of Science’, Medical Times and Gazette, 2 (1863), 258–260. Robert Hull, ‘On vivisection’, London Medical Gazette, 32 (1842/1843), 864. ‘A caution to parents’, Protestant Magazine, 6 (1844), 57–58 (Hull 1842/1843). Tom Regan and Peter Singer (eds. ), Animal Rights and Human Obligations (Englewood Cliffs, NJ: Prentice-Hall, 1989), 24 (Regan and Singer 1989). Wynter, Subtle Brains, 67 (1863); Brayfytte, ‘Experimental physiology: what it is, and what it asks’, Animals Guardian, 2 (1891/1892), 39–42. Simon Chaplin, ‘The heroic anatomist: dissection and the stoic ideal’ (2008), retrieved from http://www.rcpe.ac.uk/library/listen; A.W. Bates, The Anatomy of Robert Knox: Murder, Mad Science and Medical Regulation in Nineteenth-Century Edinburgh (Brighton: Sussex Academic Press, 2010), 21; Boddice, ‘Species of compassion’ (Bates 2010; Chaplin 2008). ‘Vivisection at Alford’, Lancet, 2 (1860), 395–396. Rupke, Vivisection in Historical Perspective, 22. Drummond, The Rights of Animals, 145; ‘Christianity and its effect upon man’s treatment of animals considered’, Church of England Magazine, 6 (1839), 294–296; K.F.H. Marx (transl. J. Mackness), The Moral Aspects of Medical Life (London: John Churchill, 1846), 121 (Marx 1846). ‘F. Lallemand, Observations pathologiques propres à éclairer plusieurs points de physiologie’ (review), London Medical and Physical Journal, 53 (1825), 238–245; Robert Knox, ‘Some observations on the structure and physiology of the eye and its appendages’, Lancet, 1 (1839), 248–251 (Lallemand 1825; Knox 1839). M. Lordat, Mental dynamics in relation to the science of medicine’, Journal of Psychological Medicine and Mental Pathology, 7 (1854), 252–263 (Lordat 1854). Regan and Singer, Animal Rights, 27 (1989). Wynter, Subtle Brains, 68 (1863). ‘Necessity the cheat of humanity’, Animals Friend, 9 (1841), 16. ‘Our programme’, Animals Guardian, 1 (1890), 2. Marshall Hall, ‘On the mechanism of the act of vomiting’, Lancet, 2 (1828), 600–602 (Hall 1828). Diana E. Manuel, ‘Marshall Hall (1790–1857): vivisection and the development of experimental physiology’, in Rupke, Vivisection in Historical Perspective, 78–104 (Manuel 1990). Marshall Hall, A critical and Experimental Essay on the Circulation of the Blood (London: R.B. Seeley & W. Burnside, 1831), 2–7 (Hall 1831). ‘Prosecution at Norwich’, British Medical Journal, 2 (1874), 751–754. Sarah Wolfensohn and Maggie Lloyd, Handbook of Laboratory Animal Management and Welfare (Oxford: Blackwell, 2003), 8 (Wolfensohn and Lloyd 2003). French, Antivivisection and Medical Science, 112–158; M.A. Finn and J.F. Stark, ‘Medical science and the Cruelty to Animals Act 1876: a re-examination of anti-vivisectionism in provincial Britain’, Studies in the History and Philosophy of Biology and Biomedical Science, 49 (2015), 12–23 (Finn and Stark 2015). E.M. Tansey, ‘“The Queen has been dreadfully shocked:” Aspects of teaching experimental physiology using animals in Britain, 1876–1986’, American Journal of Physiology, 274 (1998), S18–S33 (Tansey 1998). G. Candy, ‘The legal definition of cruelty in relation to the animal world’, Animals Guardian, 1 (1890), 5 (Candy 1890). Quoted in Vyvyan, In Pity, 87. Finn and Stark, ‘Medical science’ (2015). Wellcome Library, London (hereinafter Well) SA/RDS A3; ‘Do they ever say “no”?’ (editorial), Animals’ Defender, March 1954, 46. Cobbe tried and failed to prosecute David Ferrier in 1881. F.L.O. Morris, The Curse of Cruelty. A Sermon [on Ps. Xxxvi. 6] Preached in York Minster (London, England: Elliot Stock, 1886), 80 (Morris 1886). Anon., Animals Guardian, 2 (1891/1892), 33. Vyvyan, In Pity, 28, 77–78. Amongst other tortures, Bernard employed an ‘apparatus for determining the effects of heat upon live animals’. He wrote: ‘The animals exhibit a series of symptoms always the same and characteristic. At first the creature is a little agitated. Soon the respiration and circulation are quickened. The animal opens its mouth and breathes hard. Soon it becomes impossible to count its pantings; at last it falls into convulsions, and dies generally uttering a cry’: Frances Power Cobbe, Light in Dark Places (London: VSS, n.d.), 20. ‘Our programme’, Animals Guardian, 1, (1890), 2; G. Candy, ‘Should the vivisection act of 1876 be repealed?’, Animals Guardian, 1 (1891), 49–50; ‘“Plain truth” past and present’, Animals Guardian, 2 (1891/1892), 6–9 (Candy 1890, 1891). Chien-hui Li, ‘Mobilizing literature in the animal defense movement in Britain, 1870–1918’, Concentric: Literary and Cultural Studies 32.1 (2006), 27–55 (Li 2006). Charles Darwin, Times, 23 June 1876: Darwin Correspondence Project, Letter no. 10,546, viewed 12 July 2016, http://www.darwinproject.ac.uk/DCP-LETT-10546 (Darwin 1876). Samuel L. MacGregor-Mathers, ‘The roots of cruelty’, Animals Guardian, 1 (1890), 27 (MacGregor-Mathers 1890). ‘Hyrtl, prof. of anatomy, Vienna, on vivisection as demonstration to students’, Zoophilist, 1 (1881/1882), 145 (Hyrtl 1881/1882). Glaholt, ‘Vivisection as war’; editorial, Zoophilist, 1 (1881/1882), 190 (Glaholt 1881/1882). Anon., Zoophilist, 1 (1881/1882), 244; ‘Items of interest’, Animals Guardian, 1 (1890), 34–35 (Anon 1881/1882, 1890). Lewis Carroll, ‘Some popular fallacies about vivisection’, Fortnightly Review, 23 (1875), 847–854 (Carroll 1875). ‘Two views of the vivisector’, Zoophilist, 1 (1881/1882), 194. Times, 25 April 1881, 10. Lady Burdon Sanderson, Sir John Burdon-Sanderson: A Memoir (Oxford: Clarendon Press, 1911), 157; Parliamentary Papers, 41 (1876), Q5482 (Sanderson 1876). Quoted in Boddice, ‘Species of Compassion’. Chaplin, S. (2008). The heroic anatomist: Dissection and the stoic ideal. Retrieved from http://www.rcpe.ac.uk/library/listen. Darwin, C. (1876, June 23). Darwin correspondence project. Times, Letter no. 10,546. Retrieved July 12, 2016, from http://www.darwinproject.ac.uk/DCP-LETT-10546.